Here’s the catch: almost all of the other newcomers we know feel the same way — and there are a LOT of newcomers here, with more and more coming every day. And according to several realtors we’ve spoken to, apparently the rumors about a large religious group (up to 200 families) coming to Boquete are true. One agent told us that she had met a gentleman, a housing locator, who is going around securing rentals for these families. Just WHERE exactly are they going to live? 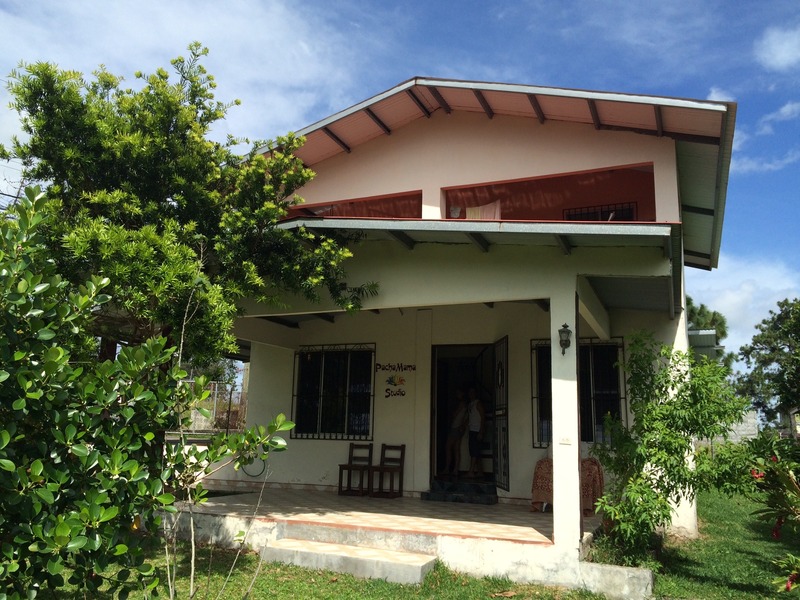 A very cute Panamanian-style house with a fenced yard and nice view that we seriously considered, for only $750. But the kitchen and living room were TINY. We passed. It’s a landlord’s dream market, and it’s reflected in the rents. In our opinion, after two months of hard searching, most long-term rentals in or near Boquete for under $800 are just not worth the price. We’re not fussy people and we’re not asking for much – a dog-friendly home with a fenced yard, a decent Internet connection (since I’m still working), and no water issues. The rentals that offer these things for less than $1,000 are few and far between, and they tend to be small Panamanian-style houses. Now, we have nothing against that; in fact, we prefer local charm and a Panamanian neighborhood to some of the gringo-style tract homes that are becoming popular here. But we would prefer a larger kitchen and a more open floor plan than we’ve seen in the typical Panamanian house. A thousand a month – $12,000 a year – is a lot of money to throw away on rent. Therefore . . . drum roll . . . we’re now taking a serious look at buying a home. In the coming weeks you’ll be hearing a lot more about that in this blog. In the meantime, we want to offer up some advice, based on our current experience with the rental market. 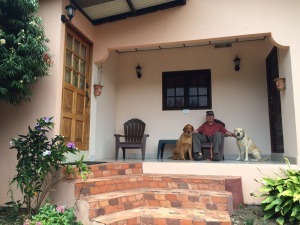 Outside the pet-friendly apartment at Casa Valhalla that we rented for the month of May. It’s more of a short-term vacation rental. First, get your boots on the ground. We can almost guarantee you won’t find a place, or at least something you’d be happy with long-term, if you try to do it from a distance. Consider a short-term vacation rental first that will give you a chance to get familiar with the different areas and micro-climates (they vary widely) in and around Boquete. Make some friends that will go to bat for you and keep their eyes and ears open for rental properties. After almost five months here, we’ve built a fantastic network of friends, property managers, and others who have kept us posted when they hear of available properties, and we’re STILL looking. Second, consider David or one of the warmer communities down the hill from Boquete. We really like David. It’s becoming a very cosmopolitan city, with Panama’s rising middle class driving a boom in housing, shopping malls, and restaurants. But it’s out of the question for us, and here’s my TMI reason: I am well into that lovely hot-flash stage of life, and the flashes I get down in David are truly epic. Every time I go there, I melt into a sad, sweaty little ball of crankiness. Think Wicked Witch of the West, only meaner – and John doesn’t fare much better in 90 degrees and 80 percent humidity. HOWEVER, we have good friends there that rent a sweet little home for under $400, and they do get a nice breeze on occasion. If you can tolerate the climate and don’t mind living in air conditioning, David is do-able and much more affordable. The further up you go towards Boquete, the cooler and less humid the climate, and the higher the rents. Caldera, Los Molinos, Las Trancas, and Brisas are all lovely areas but they’re still a bit warmer than we prefer. And even in those areas, there’s a dearth of quality rentals. Our current rental, a wonderful fit for us at well under the market rate. The catch: the owners are coming back in November. Third, ride the cycles. When we arrived here in May, high tourist season was winding down and the rainy season was just beginning. At that time of year, many part-time residents from Canada or the U.S. head home and need short-term (up to six-month) renters to occupy and serve as caretakers for their homes. We lucked into just such a rental, a wonderful home with an acre of fenced land for our dogs. The owners are returning at the end of November, but it bought us six months to get acclimated and decide if Boquete and Panama are for us (emphatically, they ARE!). At this writing, we are deep into the rain and high season is just around the corner (from November through April). If you plan on moving down here during that period, you can count on higher rents and an even greater shortage of rentals – even for the short term. If you can postpone your move until May or so, you’ll stand a much better chance of finding something affordable. 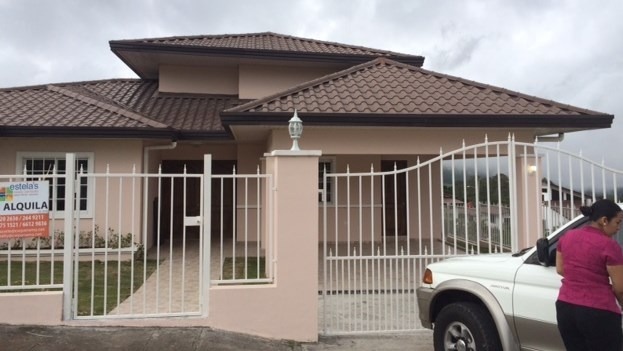 A brand new 3/2 home, unfurnished and with no appliances for $1,000. Not having a stick of furniture to our name, we passed. We’ve since learned it’s been rented for $1,200! Fourth, don’t despair. As I mentioned, good Internet and dog-ability are two musts for us. If you don’t have pets and don’t need high-speed Internet, and if you’re willing to look outside of Boquete proper, you’ll have more options (it was surprising to us how few landlords will consider pets here). Also, if you’re willing to consider a Panamanian-style home in a Panamanian neighborhood, you’ll find more – but you just might need to adjust your expectations a bit. If you build your network, and if you’re willing to make the search a full-time project for many weeks (as John has done), you WILL find something. We’re not trying to be downers, but one goal of this blog is to paint a realistic picture of life here in this wonderful country that we are so, so lucky to call home. We know there are many people reading this blog who are planning a move down (and some of our readers who are now here). We hope our experience is at least half as helpful as the fantastic advice and assistance we got, when we were planning our move. And we wish you – sincerely – buen suerte. Wow, Susan, this is a bit of downer, seeing as we are planning to move at end of next March. We are hoping to find something in Boquete that will accept our dog as well. Thanks for the boots on the ground real info though. Hopefully when we arrive we can be blessed with an acceptable place. What’s with the 200 families, that’s a bit crazy, and cause for rental concerns like you said. Looking forward to hearing more from you in coming weeks. Eric, we really didn’t mean this as a downer! It’s just reality at the moment. And since you two aren’t coming until March, you stand a good chance of landing a “snowbird” rental like we did, a place to park at least through the rainy season. And by then, the market might have changed radically – who knows. As far as the 200 families, rumors have been flying (there’s lots of stuff, some of it crazy, on Boquete Ning if you’re interested). We don’t want to be rumor-mongers, but respected realtors in town have confirmed the people are coming. We only know two things: they are a fundamental Christian group, and they might be associated with the end-of-times “ministry” of a certain Daniel Daves (google him for tons of info). That’s all we know. We certainly wish them well and we hope they know what they’re getting into. Hi Lin – congrats on finding a rental. That’s great news! Yes, the upside down roof was quite a revelation. Buying property in Panama is a whole different ball game! At least you’ll be able to build your house to your own specs. Eric, I’m not worried a bit about you and Wanda. You have done your research and made your fact-finding trips, and you’re coming down with your eyes wide open. You WILL find something and we’ll do what we can to help you. The head-scratching people are the ones that rent or buy a property sight-unseen, or worse, trust someone else to come down and rent them something. Or people who are trying to escape whatever they don’t approve of back home and think they’ll find a paradise down here. We do LOVE living in Panama, but they’re in for a rude awakening. am enjoying your adventures! Good luck with finding a house. I really liked this post Susan because it is REAL. We are experiencing the same thing in San Juan del Sur on the Pacific coast of Nicaragua. It is another landlord’s paradise. Our son is coming to Nicaragua for 6 months..during the high season..and renting a house in San Juan del Sur. Fortunately, he is bringing 5 other people with him, all of his friends that work in Yosemite National Park with him and have the winter off work. That makes it cheaper to rent a bigger house with more bedrooms. He started his search early and found a perfect house with 3 bedrooms and a pool for $1,000 a month. He was one of the lucky ones. I am afraid the days of cheap rentals in high tourist areas of the world are gone, except for low season. We have seriously considered building a long-term rental on our property on Ometepe Island. Many of our expat friends in Granada bought property in town years ago when it was cheap. Now, they have one or two long-term rentals that they built beside their homes and they never have trouble finding expat renters. As far as the “cult” coming, I wish you the best of luck. We have our own cult on Ometepe Island and I’ve been trying to get them out of Nicaragua for years, with no luck. The cult leader recently died, but he leaves behind a new leader. Very disturbing news. I am off to google Daniel Daves. Thank you for your kind words, Deb! I think we share the same philosophy as bloggers. We don’t want to scare anyone off but we do think we owe folks as much honesty as we can offer. The expat lifestyle really isn’t for everyone and does require a lot of research and soul-searching. But one of the huge rewards, at least for us, is the like-minded friends we’ve made here. That is interesting about the rental market in Nicaragua. When we visited there on our boat in 2003, it really seemed to be an undiscovered paradise. Looks like it’s gotten discovered. I hope the Nicaraguan government has what it takes to manage the growth for the benefit of everyone. Good post! People need a realistic picture of what is going on here. We have enough info viewed through rose colored glasses and that doesn’t do anyone any favors. I’m sure you have thought about Dolega or somewhere part way up the mountain that might also work? The whole area is growing like crazy though. 200 families?? Why Boquete?? It’s full enough up there already. We’re currently looking as far south as Brisas – we thought about up towards Portrerillos, above Dolega, but haven’t seen anything we love there yet. Gosh, that’s tough! I hope you will find the house that you wish for. About buying a house there, perhaps will not be such a bad idea, judging the market then perhaps you can rent it in the future with good price. Wishing you the best! Thank you, Indah. Yes, we’ve come to realize that owning a home doesn’t necessarily tie us down because we can always rent it. There are so many options! Well…we are going to have some fun!!!! NOT!!!! My husband is flying to Panama in early November to find a rental for the 2 of us and our dog! I will follow with the dog at the end of January!!!! Oh no…we were hoping for Boquete but I may tell my husband to just focus in David! Wish us luck!!!! Looks like we will need it! Good luck with it! Let us know if there’s anything we can do to help. We are staying with friends this month in Boquete. We opted for a long term lease in Gorgona starting in November because it was getting harder and harder to find even short term rentals. Boquete has been nice but we do miss the beach and the heat. Good luck with your search. Hi Andrew, and welcome to our blog! The best way to find a rental here is to be here, on the ground, and put out as many feelers as you can. The market continues to be very tight. When we first arrived, we stayed for a month in a vacation rental (Casa Valhalla) to get our feet on the ground, and that’s when we started researching longer-term rentals. I believe we found that first house on Boquete Ning. It’s a terrible site now (in other ways) but still one of the best sources for rentals and real estate listings. Hi Anita! Once again, I’ve come across a comment of yours that I didn’t see earlier. But thanks for the feedback!